Hillary Clinton responds to Iran nuclear deal: Offers support, but stresses caution. What a pleasant surprise! 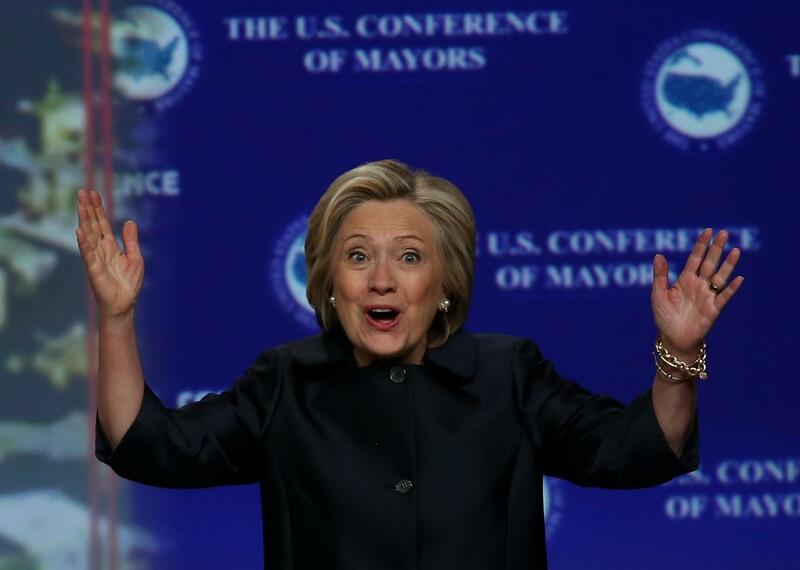 Above, Hillary Clinton speaks at the United States Conference of Mayors on June 20, 2015, in San Francisco. The crowded field of presidential hopefuls played to type on Tuesday in reacting to the news of the historic deal between Iran and six world powers. Republicans responded by bashing President Obama’s negotiating skills, predicting the deal will launch a chaotic nuclear arms race in the Middle East, and calling on Congress to do all it can to scuttle the agreement. Hillary Clinton, meanwhile, offered a more measured response by praising the deal while still giving herself room to take a harder line toward Iran than Obama. “This is an important step in putting a lid on Iran’s nuclear program,” the former secretary of state said in Washington following a closed-door meeting with House Democrats. Clinton, though, went on to voice “concerns” about the Islamic Republic’s “bad behavior,” such as its state sponsorship of terror groups, and stressed that the terms of the deal would have to be enforced “vigorously, relentlessly” by the United States and its allies. “As president, I would be absolutely devoted to assuring the agreement is followed,” she said. As I noted earlier today, the responses from the presidential hopefuls aren’t just empty talking points. While the Republican-controlled Congress doesn’t appear to have the votes to overcome Obama’s promised veto of any legislation that undermines the agreement, the next president could use his or her executive authority to walk away from the deal. The Republican candidates’ reactions suggest they would do just that if given the chance. Clinton’s comments, meanwhile, suggests she’d be willing to see it through. That was not always a given. Years before Clinton helped initiate the talks that led to Tuesday’s landmark agreement, she memorably clashed with then-Sen. Barack Obama over the issue during the 2008 primary, calling his pledge to meet personally with leaders of countries like Iran “irresponsible and frankly naïve.” Later in the campaign, Clinton then threatened to “totally obliterate” Iran if the Islamic Republic launched a nuclear strike on Israel, remarks that drew a formal U.N. complaint from Iran and that prompted Obama to compare her to President George W. Bush. Clinton’s more hawkish views on Iran didn’t stop once she became Obama’s top diplomat, as Michael Crowley documents in Politico. While she and Obama were generally on the same page during the negotiations, Clinton was much more distrusting of Tehran than her boss and significantly more willing consider conflict.